Aspire Football Dreams overcame Aspire Academy by a single goal to nil in a match where the windy conditions influenced proceedings as much as any one player. In their previous game, Aspire Academy had stood up well to the unashamedly physical approach of Esperance Tunis, and were unfortunate to have suffered a single goal defeat despite playing the better football. Meanwhile, less than 24 hours after suffering a heart-breaking defeat to PSG in a dramatic quarter-final penalty shootout, AFD had to pick themselves up and go again. It said much about the professional approach of both sides that the youngsters seemed to have put previous disappointments behind them as they quickly resumed their precise, high-energy passing games. In the opening stages, AFD’s Isaac Nuhu looked particularly lively and, on 12 minutes, he carved out the first chance of the game. His strong run down the left was abruptly halted, and the tricky winger dusted himself down and took the resultant free kick himself, curling an effort towards the top corner that Academy keeper Mahmoud Abunada did well to keep out. Five minutes before half time, Nuhu got away from his marker once more and advanced into the penalty area, but Abunada was again equal to his shot. A stiff breeze blew across Aspire Zone, requiring both sides to keep the ball on the ground and play close possession football. It also provided an opportunity for the Academy, with the wind at their backs in the first half, to attempt shots from distance, but they were largely unable to escape the attentions of AFD’s combative backline in order to do so. If anything, the wind speed increased as the second half began, making it increasingly difficult for either side to retain possession, with long balls going astray and crosses sailing beyond their intended targets. It seemed that only a moment of individual skill would break the deadlock and, on 64 minutes, this proved to be the case. Academy keeper Abunada rolled the ball out to Abdulla Al-Ali but, as the centre back attempted to get away from Sibiry Kaita, the AFD midfielder robbed him of possession, cut inside and thrashed a low effort into the right-hand corner. With a quarter of an hour remaining, AFD coach Serine Dia withdrew midfield captain Leslie Adeniah for defender Salim Diaby, in an attempt to preserve the slender advantage that his side held. In truth, progress was becoming more challenging for the Academy players as they attempted to build attacks in the face of increasingly blustery conditions. As the final whistle approached, Fahad Al-Abdulla went on a mazy run through the middle, evading several challenges before letting fly, only for the wind to carry his shot high above the goal. 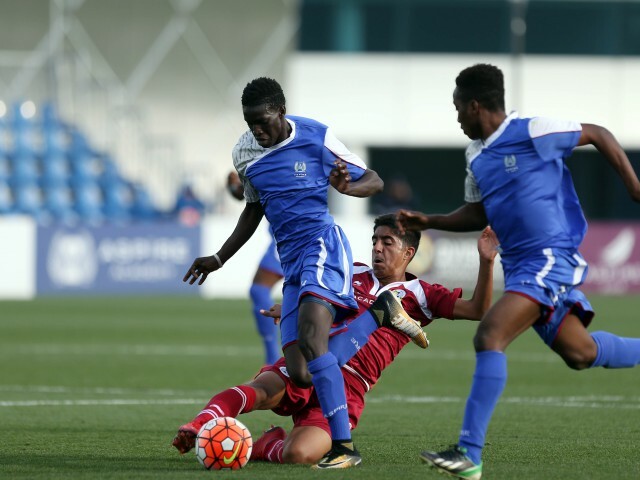 Football Dreams were ultimately good value for their win, while Aspire Academy could take pride in a determined performance that, unfortunately, produced little reward.